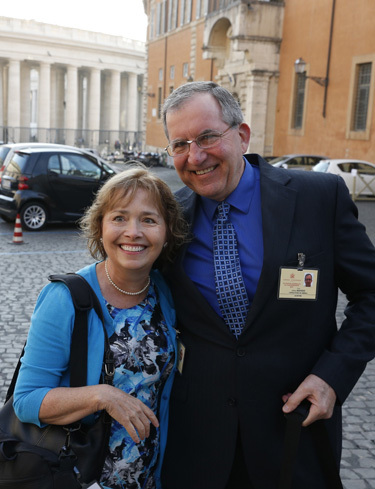 VATICAN CITY (CNS) — Catholic couples who ignore church teaching on contraception “don’t know what they are missing,” said a U.S. couple invited to address the extraordinary Synod of Bishops on the family. Alice and Jeff Heinzen, family life leaders in the Diocese of La Crosse, Wis., spoke at the synod Oct. 7, urging efforts to find new ways to share its teaching about the beauty of family life. Although the couple has practiced natural family planning for 27 years and taught natural family planning — Alice is a member of the NFP advisory board for the U.S. Conference of Catholic Bishops — they did not speak specifically about family planning in their presentation to the synod. However, in an interview with Catholic News Service Oct. 9, the couple said church teaching about married sexuality, openness to life and against the use of artificial contraception is clearly a place where new ways of presenting the message are needed. The good news, they said, is that natural family planning is good for a marriage, good for one’s health and good for the environment. Olivier and Xristilla Roussy, a French couple who are part of the Emmanuel Community and leaders of its Amour et Verite (Love and Truth) ministry for couples, addressed the synod’s evening session Oct. 9 and were honest about their experience with artificial contraception and with natural family planning. Olivier told the synod that using natural family planning to space the birth of children is not always easy, especially because sexual desire increases during a woman’s fertile period, but talking to one another and exercising discipline teaches trust and tenderness.